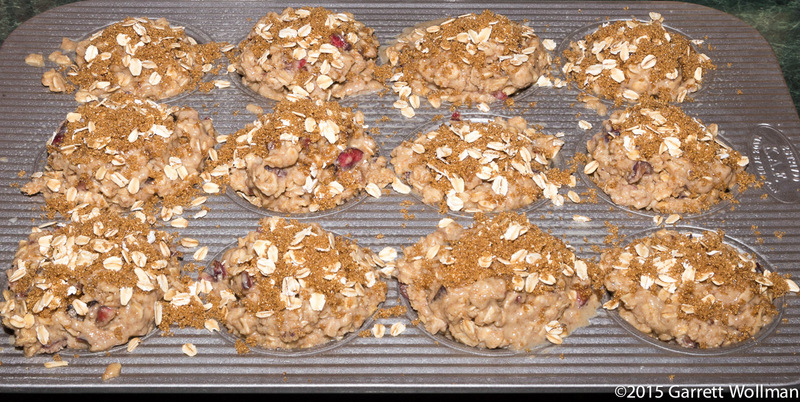 Continuing with this summer’s baking project, this week’s “easy midweek” recipe is a muffin recipe from Joanne Chang’s second cookbook, Flour, too : Brown Sugar–Oat Cherry Muffins (p. 70). Chang credits the original recipe to “Brian, one of our pastry chefs”, and like many of Chang’s quickbreads it gets acidity from crème fraîche rather than American-style sour cream or buttermilk. Everyone who tried it quite liked the flavor, even though as a “cherry muffin” it has to be considered a failure. The rap on Chang’s baking recipes is that she uses too much sugar, and this is the first time I’ve made one of her things that I’ve been in agreement with that criticism: these simply are much too sweet to be muffins, and they don’t have the right texture for either muffins or cupcakes. They also were entirely lacking in cherry flavor — more than one taster said “Oh, I didn’t know they were supposed to be cherry“. Despite that, nearly everyone thought that they were excellent, just not what the title advertised. Here’s how I did it; I can think of two things that I did that might account for the texture problems, but nothing that would seem to have anything to do with the lack of cherry flavor. This recipe uses a lot of bowls, but despite that, it’s assembled by the standard Muffin Method. Clockwise from bottom left, I have 210 g of whole-wheat flour (I used organic whole spelt flour, because I had a small amount left and wanted to make sure it got used before the fats started to oxidize); an equal mass of fresh sweet cherries, which have been pitted and chopped; 300 ml of crème fraîche (sorry, I neglected to recheck by mass); 350 g rolled oats; 115 g melted unsalted butter; two large eggs; baking powder, baking soda, and salt; 135 g granulated sugar; 165 g light brown sugar; and finally, 240 ml of whole milk. 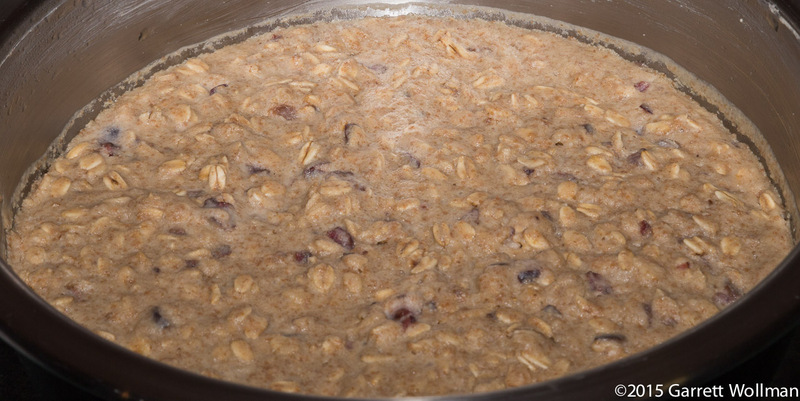 As I mentioned, the batter is made using the Muffin Method: mix all the wet ingredients together — in this case, the oats, sugar, and cherries are all considered “wet” — and then fold in the combined dry ingredients. Where this recipe departs from the usual procedure is that it calls for resting, “at least 8 hours, or up to overnight in the refrigerator”. I generally take an “overnight” rest as license to pick up the process at any time the following day, but I suspect the texture problems I’m about to detail may have been due to the long rest, and Chang really meant “baker’s overnight” — i.e., not more than 12 hours. If so, I wish she would have said as much. After nearly 24 hours in the refrigerator — covered, of course — the batter looks little changed. 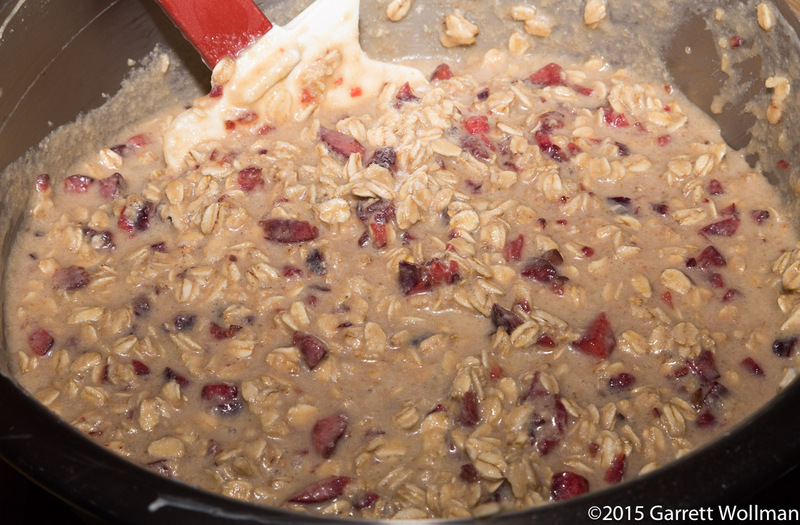 Perhaps the oats have softened a bit; presumably that was part of the intent. Spoon about 1 cup/240 ml into each muffin cup, filling it all the way to the brim and wa-a-a-y over. (It will seem like there’s too much batter for the tins, but if you want the characteristic muffin top you need to overfill them. You can make smaller muffins if you prefer …. Since the recipe calls for a yield of exactly 12 muffins — which is also the standard size of a single muffin tin — I kept on filling them until I had used all of the batter. I then applied the brown-sugar-and-oat topping specified in the recipe, which you can see, and they are ready to go into a 350°F (180°c) oven to bake. On page 71 of the cookbook, there’s a photograph showing a muffin tin with beautiful, tall, separate muffins. That’s not what I got: in the heat of the oven, the muffin batter simply slumped, and in fact flowed off the top of the tin, over the side of the sheet pan that was meant as protection, and onto the floor of my oven. Ouch! How am I even supposed to get these out? After all that, you might think this was some super-nutritious, high-fiber health food. Nope — not with all that crème fraîche! Here’s the full toll; note that I calculated this using “traditional” whole wheat; substituting either whole spelt or sprouted whole wheat does not meaningfully change the numbers. This entry was posted in Food and tagged Joanne Chang, muffins, recipe. Bookmark the permalink.